Look pulled together with an easy updo courtesy of the magic hair comb. The stretchable beaded combs instantly elevate your look and can be worn in six different styles—or you can do your hair your own way. The combs lay flat and feels comfy all day long. Comes in two sizes for different hair lengths. Dimensions: Small: 2.8" x 2" x 0.8"; Large: 4" x 2.5" x 0.8"
Weight: Small: 0.06 lb. ; Large: 0.08 lb. I bought 3 of these for my 3 daughters. They all love them!!! These are stylish and comfortable to wear. They do not pull too tight, or dig into scalp yet stay in place all day long. Love them! Janine Pretorius heads up the HairMagic family business in South Africa. 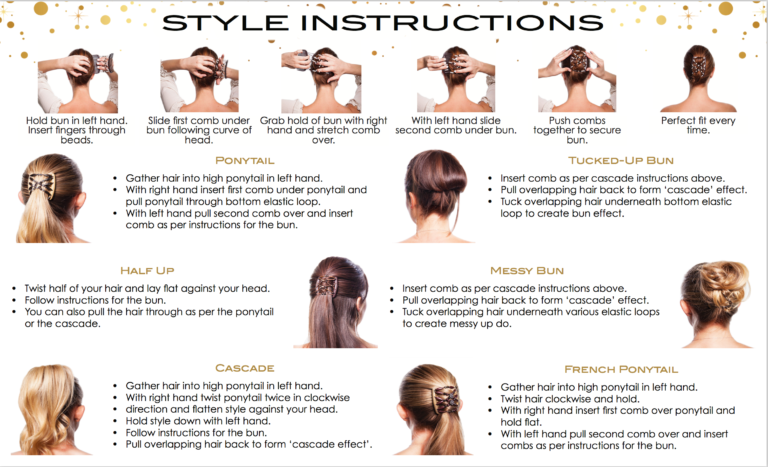 Her stretchy hair accessory creates six quick-and-easy styles that work with any type of hair—or you can come up with your own way to wear this versatile updo maker. There’s a lot to like about a fuss-free tool that can quickly transform—and polish up—your look. When we tried HairMagic out, we appreciated how comfortable it felt. The two-combs-and-stretchy-beaded-elastic-combo lies flat and stays securely in place. And we were impressed with just how easy it is to switch up how you wear your hair, regardless of length or type of hair you have. All that functionality and it looks so lovely? Definitely sounds like magic to us.